Our aim at Southchurch High School is to provide an inclusive, effective and stable careers programme for all our students from Year 7 – 11. We have a dedicated Careers Co-ordinator in school who facilitates and promotes our Careers Program alongside an Independent Careers Advisor. We also have a member of SLT responsible for overseeing the Careers Provision within the School. As such we are committed to providing great quality careers education, information, advice and guidance (CEIAG) to help raise our student’s aspirations, so they feel motivated to achieve their goals. Using the Gatsby Benchmarks we have designed a detailed strategy that ensures all of our students will take part in a wide range of activities to help inspire them and help them to make informed decisions about their future. Each year group will have a different focus and will be given bespoke opportunities throughout the school year to develop their skills and discover their potential. This includes external trips, internal visitors, PSHE lessons, workshops and visits to local Colleges and Universities. We regularly ask our students to evaluate the support they receive to ensure we are doing all that we can to achieve each focus. Students are given the opportunity to give verbal/written feedback on all the activities that take place and provide ideas of what they may find helpful to them in the future. This helps us to develop our careers strategy and continually improve the quality and effectiveness of the support we provide. We have designed the Southchurch High Careers Evolution model. It identifies our focus for each year group and the types of questions students need answering in relation to their career journey. It also helps to reassure students that they will be prepared and fully equipped for when they leave school. Below you can also see in more detail, the types of activities that students in each year will take part in to support them on their journey. Some students will attend workshops designed to help them discover the different industries of work with particular emphasis on STEM careers (Science, Technology, Engineering and Math). The Year 7 PSHE program will address the issue of gender stereotyping in the workplace so that students understand that they can pursue any career regardless of their gender. Students will have the opportunity to meet local employers and will take part in activities that use Local Market information to keep our students informed of the Industries/opportunities available to them in the area that they live. Students will have the opportunity to meet our independent Careers Advisor to discuss their career aspirations and help them to decide on the right subject options to take to support their goals. 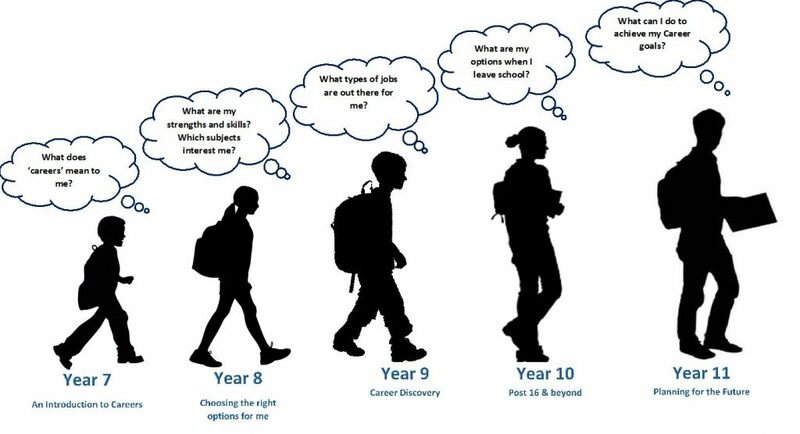 Using a career diary the Year 8 PSHE Program will look at helping students to identify their personal skills and interests and explore the different careers suited to them. Some students will visit a university campus in order for them to get an understanding of what it would be like to go to university and meet students who currently attend. Students will have an assembly on how to pick their subject options and the ‘do and don’ts’ when making their decisions. Students will attend a Careers Fair to give them the opportunity to explore a range of different job roles with emphasis on local businesses. Subject teachers will give students the opportunity to visit workplaces, exploring the types of careers available in that subject. Students will attend workshops run by motivational speakers aiming to encourage them to be independent learners and the best they can be. Students will take a closer look at Post-16 options during their PSHE programme in tutor time, alongside exploring skills and behaviours. Students will attend a Growth and Mind-set Workshop to help build their confidence and inspire them to achieve their goals. Students will visit the National Apprenticeship show to meet employers and learn more about Apprenticeships. Some students will visit Colleges and attend Taster days which gives them the opportunity to experience ‘a day in the life of a college student’. All year 11 students will have a 1-2-1 meeting with an independant Careers Advisor to discuss their options when they leave school and begin the application process. A workplace Skills/Behaviour and CV workshop will be available to all students In order to give them the tools they need to be successful in their career journey. Several activites will take place throughout the school year aimed at supporting students in their decision making so they feel full equipped in whichever pathway they choose. Careers Co-ordinator and Career Advisor will be present at the parents evening, to help students and parents with any questions or support that is needed.